So I had a request from a friend & dedicated reader asking for a preview of my New Year's Day menu that I mentioned in my post earlier today. Being the sweetie that I am (just kidding!!) I thought I would honor that request. Also, I'm curious about everyone else's traditions. What do you typically do to bring in the new year? Do you have a traditional New Year's Eve or New Year's Day meal that your family feasts upon? So what are your family's traditions? Anything special you eat or do to bring in the New Year? Let me know! Have a safe & happy New Year's weekend. I hope everyone has a blessed 2006!! Welcome back from the holiday disarray! So Christmas is but a memory left behind like all those crumbs in the bottom of my cookie jar. 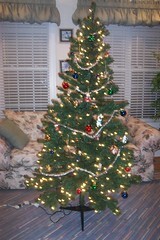 It was great fun, but like every other holiday before it, Christmas 2005 has passed. Now I'm ready to move on to other great things like New Year's Day dinner!! Cold Stone Creamery to "Pledge Your Fruitcake Freedom". Turn in a fruitcake at Cold Stone and they will give you a $5 gift certificate for an ice cream cake. If you like ice cream, but hate fruitcake sounds like a good idea to me! And how many of you killed your kitchen aide or broke your blender with all the holiday baking and cooking? The kitchen gods saved me from that awful fate this year, but if you weren't so lucky I might have a less expensive solution to replacing the ENTIRE appliance. Culinary Parts Unlimited has an extensive website of different types of cooking appliances and tools, they even have electric toothbrushes and shavers. Culinary Parts Unlimited also sells the parts and pieces for broken countertop appliances including food processor lids, coffee carafes, and the part to that broken blender I mentioned. We interrupt your regularly scheduled blog for this announcement. For once I'm gonna keep it short and as always I'm going to try to keep it sweet. My mixer is running 90 miles an hour nearly 24 hours a day and we no longer need the furnace on, the oven is heating the house just fine. Ok, maybe I'm going overboard a bit. But I have definitely whipped myself into a holiday baking & cooking frenzy. I can't lie - I love every second of it! Each morning I wake up almost giddy with thoughts of what culinary bliss the day ahead entails, and that part I'm seriously NOT going overboard with. Pinky swear. I just wanted to check in and let you guys know I will be back in a few days when all my foodie gift boxes have been sent out the door. No worries, I will have lots of photos along with plenty of sweet details. I know we're all in a baking frenzy right now and the Christmas cookie baking started loooong ago, but for the last minute bakers and those of you still in search of new cookie recipes check out this site I read about in the Charlotte Observers food section on Wednesday. http://www.christmas-cookies.com Thanks to Canadian cookie fanatic and web designer Mimi Cummins we all have access to a website devoted strictly to CHRISTMAS COOKIES!! The site provides you with over 400 recipes, baking tips and a bullentin board for discussions. And for those of you short on time or baking challenged Betty Crocker is here to help, with more cookie recipes, only these have minimal steps and require very few ingredients in addition to the Betty Crocker cookie mixes. The cookies look so festive and cute. Check em out! I find myself craving these cookies..I mean really craving them. I've always been a gingerbread lover. But these cookies are over the top good to me. Just the perfect amount of spices and the texture is amazing, soft and chewy. They almost seem to melt in your mouth. One thing that intrigues me about this recipe is that it contains NO butter. None. Zero. Zilch. Not a single ounce. I've never tried sub'ing butter for the oil, I figured why risk ruining a wonderful thing? Curiousity hasn't gotten the best of me with this recipe, and I'm determined that it never will. The dough is formed into balls and half is dipped in sugar so they come out having these yummy little sugary sweet crunchies on top. Unfortunately when using just plain white granulated sugar those crunchies don't show up in the finished product, so this year I purchased what Wilton calls Sparkling Sugars, which is basically just sanding sugar. I'm not sure where this recipe actually originated. It was given to me by my boss at the time, titled "Angela's Gingersnaps", Angela being his wife's name. So possibly she developed or perfected the recipe. If so she came up with one hell of a cookie and my praises go out to her. Sift together flour, baking soda, cinnamon, ginger and salt, set aside. Mix together oil, eggs, sugar and molasses just until combined. Add flour mixure and stir until all ingredients are incorporated. Roll dough into small balls, about 1 tsp each. Dip 1/2 of each ball into sugar and place sugar side up on cookie sheet. Space several eachs apart. Bake at 350 degrees for 8-10 minutes. Tag I'm it!! I was tagged by Alice for my first ever Meme. How exciting! This is such a fun meme, and one that seems to be flying through the blogosphere faster than you can say chocolate cake. Pretty fast huh? 1. Mac & cheese. Give it to me from a box or fresh from the oven baked in a casserole dish, I'll eat em both eagerly. Simply put I love mac & cheese. And truthfully I think it tastes better using the cute little elbow noodles. 2. Potatoes - I like em boiled, baked, fried, hash browned, roasted or mashed. I'm definitely a carb lovin kinda girl. 3. Bananas - I rarely eat them plain, although I like them that way. My favorite way to eat them is sandwiched between fresh soft white bread with some Duke's mayo. Or in a nice cold, fresh 'nana puddin. Heavenly! 4. Chocolate - In my diet, and I use the term very loosely, chocolate is a food group all by itself. Chocolate & I have had a love affair for as long as I can remember. I love the simple and inexpensive just as much as the decadent gourmet stuff. That's right, I'll devour almost anything Hershey's just as quickly as I will something Scharrfen Berger. 5. Coffee - I went back and forth about including this on my list because true, coffee is not a food, but actually it sometimes is. I mean people do eat coffee beans yanno? Not me though..a tad too bitter for me. Coffee is a daily experience for me and I love it in so many different things. A steaming cup with my breakfast in the morning, or my dessert at night. Never black though, always with plenty of sugar and cream. Espresso truffles?? Heavenly!! Mocha Java brownies, to die for!! Latte ice cream, the best thing since, well lattes. I don't much care for Starbucks coffee though, but I haven't found another place that actually knows how to make a latte. 6. Pizza - We go waaaay back, it's always been a favorite for me. Thick crust, thin crust, homemade or delivery. I love it all. Pepperoni, supreme, anything but just cheese please. The one I really crave for though? BBQ Chicken Pizza..I've been hooked since that first bite at California Pizza Kitchen. 7. Peanut Butter. I prefer creamy to crunchy, but I'll eagerly eat either one. On crackers, or between bread with jelly. In cookies or paired with chocolate to make peanut butter cups. Heck just give me a jar and a spoon, I won't complain. 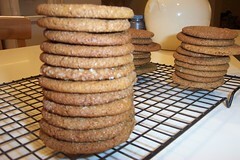 And one can't forget my delicious boiled PEANUT BUTTER cookies!! 8. Red Velvet Cake - In all it's pure southern decadence. It was an addiction at first bite. 9. Mint Chocolate Chip Ice Cream - Truth be told, it doesn't even have to be ice cream. I haven't tasted a single thing that was chocolate & mint that I didn't love. But for as long as I can remember I have loved mint chocolate chip ice cream, and I'm not even a big ice cream eater. It's just something about that amazing flavor combo that I love. 10. Bread - The southern girl in me loves cornbread and buttermilk biscuits. The carb lover in me just loves bread period! I eat bagels(onion) and english muffins(whole wheat) like they're going out of style. Focaccia, ciabatta, baguettes, just give me bread for pete's sake..please. 11. Cream Cheese - I know I know. It's supposed to be my 10 favorite foods, but let me have this one please?? I told you I love bread right?? How can I eat bagels or english muffins without cream cheese?? And red velvet cake without cream cheese frosting??? Please lord no. I tag my dear darling Alicat over at Something So Clever, and Jennifer over at Fallen Souffle, whom I don't actually know, but I saw her blog recently & I dig it That will be all for now =) And I'm coming back in to add Heather over at Eating For One. So we did a Girls Night In last weekend and I couldn't resist baking some cupcakes. My dear friend's husband cooked dinner & it was absolutely delish!! I tell ya, when I get married I hope my husband is able to cook atleast 1 dish as tasty as this meal was. We had roasted chicken & garlic steamed rice. He marinaded the chicken in lemon juice for about 6 hours then sprinkled it generously with Montreal chicken seasoning & roasted it to golden perfection. The rice was steamed to gooey deliciousness with slivers of garlic scattered throughout. Needless to say, I was stuffed. Not sure how any of us found room in our overly filled bellies for a Pepperminty Pink cupcake, but we did & they got good reviews I'm happy to report. The cupcake baking was very spur of the moment, and the cake recipe was a new one for me. They're just a plain ol vanilla cake, but I hadn't yet found a standard vanilla/yellow cupcake recipe so I gave them a shot. 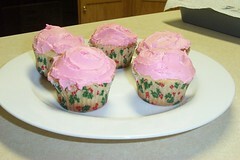 They had a nice flavor and were sufficiently moist, so they will make a reappearance sometime soon I can assure you. The frosting, well I can't really supply a recipe for that, it was a little of this and a little of that. Heat oven to 400 degrees. Line 24 muffin cups with paper liners. Beat all ingredients with electric mixer on low speed 1 minute, scraping bowl constantly. Beat 3 minutes more, scraping bowl frequently. Fill muffin cups half full. Bake 15-18 minutes or until toothpick inserted in center comes out clean. Cool 2 minutes; remove from pan to wire rack, cool completely. Using electric mixer, cream butter, gradually add sugar, beating well to incorporate. Add milk & peppermint extract, beat until fluffy. I would recommend to start with 1 teaspoon of extract, once you have combined in well, taste & continue adding by half teaspoon until it suits your taste. Then add red/pink coloring until it's pink enough for ya! Drumroll Please!! Introducing "The Weekend Cookbook Challenge"
Alicat from Something So Clever and Sara from i like to cook. The first challenge is dig out the oldest cookbook from your collection & prepare a recipe. It can be your oldest cookbook by copyright date or simply your very first cookbook. 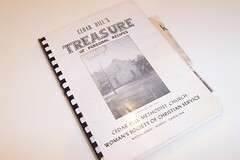 For my entry I've chosen to feature the book that's oldest according to copyright entitled "Cedar Hill's Treasure of Personal Recipes". My oldest is truly my most treasured cookbook. It's a collection of recipes from the ladies of the church my family has been members of since..well probably for as long as the church has been in exsistance. The book contributes largely to my earliest childhood food and cooking memories, most of which included my grandmother aka Nana. As I flip through the yellowed and tattered pages, I recognize recipes and names that are all too familiar to me. Scattered throughout the book I find newspaper clippings with household remedies for various issues, recipes clipped from the food section of the local paper Nana probably saw while reading the paper, much like I do and thought she would one day try out in hopes that the family would enjoy something new and different. And then I get to the back of the book to what I treasure most, those recipes handwritten by Nana. Seeing those recipes brings her back to me. I see her sitting there again, pen in hand, scribbling something down in her ever dainty handwriting. God I miss that woman..
boiled cookies. I know, they sound a bit unusual, but they are absolutely FABULOUS!! I swear, once you taste them you'll know there is nothing weird about these cookies. YUM-O!! We always for forever have had these cookies at Christmas and I have to admit, they're a HUGE part of why I look forward to Christmas, these days anyway.. So yeah this challenge couldn't have come at a more perfect time - I got to feature my beloved cookbook and make the boiled cookies. I'm as sentimental as the next girl, but I'm not usually one for the public displays of sentiment..wait..what am I talking about?? Yeah I am..So I'd like to dedicate this to my Nana, if I can ever be half the woman she was, I know I'll be amazing. Look Gram - I BOILED cookies!! Growing up I could always tell when it was getting close to Christmas because my grandmother would whip up a batch or two of her famous oatmeal cookies. They are outta this world and not like anything else I've ever tasted. I would venture to say that MOST people reading this probably have never had a cookie quite like this. They're BOILED not baked. Yes I said boiled!!! They are outta this world, simple with few ingredients...a very unassuming, unsophisticated cookie, but gosh I could eat myself sick with these cookies. And yanno what?? Tummy ache and all I would still be the happiest thing you've ever seen...they are that delicious! The cookies cotain no flour, the base is peanut butter and oatmeal, and seems extremely simple...well if you have the knack for making these it really is simple. I've always been the baker in my family and I tried for years and years to make these cookies, always failing miserably. They would always taste fine, but the consistancy was always totally wrong. It's SO totally unexplainable. But last year I finally beat my struggles & knock on wood I got the hang of it 'cause I've done 2 batches this year & both came out. The chocolate batch was a little off, a tad bit soft, but they hardened into those delicious little cookies I remember from my childhood. 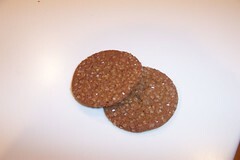 So I challenge you, no better yet I encourage you to try these cookies out & let me know how you do. I would love to know if you enjoy these cookies as much as my family does. Mix and boil sugar, butter/margarine, cocoa & milk for 1 minute. Remove from heat, add vanilla, peanut butter, oatmeal & nuts. Mix well. Spoon by spoonfuls onto wax paper. *Work quickly as mixture will start to thicken in a hurry. 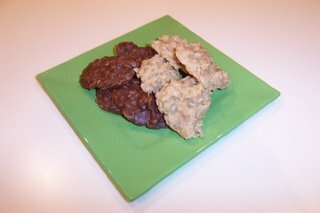 I've tried both quick-cook and old fashioned oatmeal with these cookies and been sucessful & unsucessful with both. So I guess it's a toss up. I used old fashioned this year. WDB #12 - Happy Birthday to my little man! 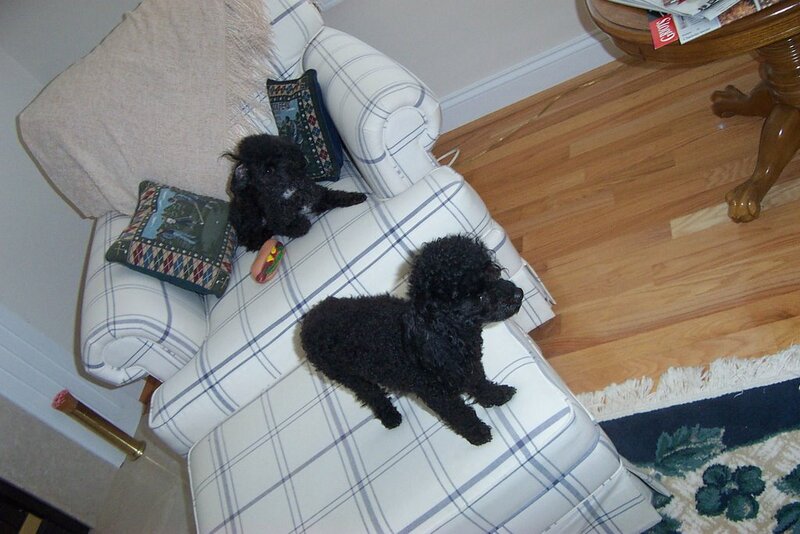 The boys wanted to get in on the blogging action again this weekend...Sammy & Stumpy don't mind letting me get in a quick photo while they're lounging in the easy chair. Don't know what they were eyeing in this pic..probably some food being prepared over in the kitchen. And I'm ashamed to say I almost forgot my baby's birthday. Yes, Sunday was Stumpy's birthday. He's 2 years old today. Excuse me if I start to get a little misty eyed, you know how it is, us mother's get a little emotional sometimes...it's just that our babies grow up so fast don't they? Sweetnicks for hosting the weekly "Weekend Dog Blogging" Event! Dinner was totally YUM-O & delish tonight!! I made grilled burgers stuffed with cheddar cheeese & oven fries. My first time stuffing the burgers with cheese, the concept was good. Outcome? Not so good. The burgers were totally tasty, but next time I will definitely use a less greasy cheese as the cheddar totally ran out of the burgers as they were grilling. The fries were what totally excited me. They were completely last minute. Normally I would just do burgers with store-bought chips, but I had some baking potatoes in the crisper & wanted to do something a little different so I didn't feel like I was being a total slacker yanno? lol The fries are definitely not something you can do in a quick Rachel Ray 30 Minute Meal kinda way, took me more like 45 minutes. Just wash your potatoes, slice them into even size slices, parboil for about 5-10 minutes to cut down on your oven time. Drain & put them on the baking sheet, drizzle with some EVOO, add a little salt and the seasoning of your choice. I used a small amount of seasoned salt & some sea salt. Toss potatoes to cover evenly with oil & seasoning. 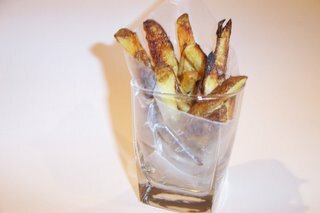 Bake them in a 450 degree oven for about 30 minutes - depending on the size of your potato slices. I stirred them halfway thru cooking so they wouldn't stick to the pan & would cook more evenly. Totally simple! !